Breathless by Brigid Kemmerer (review copy) - WARNING! I cannot review this book without spoiling the others in the series. Read no further if you're planning on reading this series and don't want it spoilt for you. Nick Merrick is supposed to be the level-headed one. The peacemaker. Since it's just him and his three hotheaded brothers against the world, that's a survival tactic. But now he's got problems even his brothers can't help him survive. His so-called girlfriend, Quinn, is going quick as mercury from daring to crazy. Meanwhile, Quinn's dancer friend Adam is throwing Nick off balance, forcing him to recognize a truth he'd rather shove back into the dark. 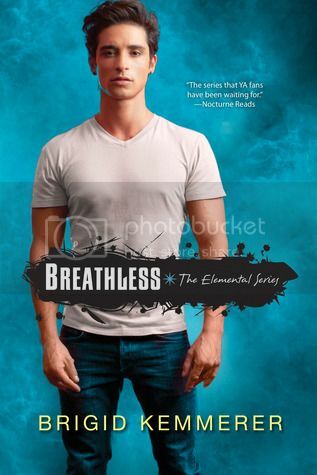 Considering how much I love this series, it will be no surprise to you that I jumped at the chance to read Breathless early when it became available to review on NetGalley. And as expected, not only did it not disappoint, it blew me away! Oh, Nick! Oh, how I love Nick! And do you know what I love more? How Nick hasn't changed at all from the Nick we see in the previous books. We're in his head now, and so we're discovering things about him that we didn't know before - a number of things - but he's still the same guy. It's not like Kemmerer decided this was who Nick was going to be mid-series, and created someone who seems completely knew, who wouldn't have acted the way he did in the past. It feels like this is who Nick has been all along, but we're only now just finding out who that is exactly. There are various decisions that Nick has to make, things that are covered in this novella, but yet to be decided about. This is mainly because he's worried about what his family will think. Take college for instance; he want's to learn, be away from danger, be away from people knowing what he is and wanting to kill him. Yet if he does that, Gabriel will not be happy, Michael will struggle even more with work as he won't be there to deal with the books or help out with clients, and Chris... we'll, we all know already that he relies on Nick to be the family peacekeeper. He's struggling with what he wants, what's best for his family, and what may make them angry. It was so sad knowing Nick feels this way, because I believe with all the things he's going through, his family, though they may be surprised at first, will be on his side. I just wanted to give him a big hug! Quinn. Quinn, Quinn, Quinn. That girl has some serious issues with herself, and I believe the fault lies at home. We've heard about the dramas between her and her mother in previous books, but we actually get to see them first hand in this novella, and dear god. It's worse than I thought. I thought she was just a bit of a drama queen, but her older brother is a git, and her mother lets him get away with it while being the biggest cow you could possibly imagine! Home for Quinn is not a place of love and safety, it's a place of constant mental abuse, and because of it has terribly self-esteem, and seeks approval and "love" by doing the only thing she knows is guaranteed to get her some attention - at least for a while. It's heart-breaking to read her side of this story, but I'm really looking forward to seeing her deal with this in the future. Another character I seriously wanted to need to hug. Thought-provoking, shocking, disturbing, hot and sweet all rolled in to one, Breathless is a novella fans of the series do not want to miss. I would even go as far as saying it's should be read before reading further in this series - this novella is going to have consequences! Another stellar novella from Kemmerer! Thank you to Kensington Books for the review copy via NetGalley. Oh my god I can already see the FEELS! Reading Spark I felt so desperately sad for Gabriel and I wanted to spend most of the novel giving him a hug and then locking him and Nick in a room together so they could talk out their issues. Reading this I think it's going to be just as bad, if not worse, reading Nick's story, and I'm really looking forward now to reading Quinn's side. I know what you mean! I am astounded at Kemmerer's ability to get you so deeply invested in her characters even in a novella, which is over in no time at all!